THEM Anime Reviews 4.0 - Say, "I Love You"
Notes: Based on the manga by Kanae Hazukim, which as of December 2014 is still serializing in Dessert. A live-action film adaptation was released in July 2014. Mei Tachibana has not had any true friends in a long time; a childhood bullying incident convinced her that people only backstab and lie, and she has thus spent her high school years alone, save sparse interactions with her widowed mother and the people at her part-time job. Things change all of a sudden when she accidentally kicks Yamato Kurosawa, who is highly popular and sought-after, while lashing out against another student's accidentally tripping her, thinking that it's more than an "accident". Kurosawa, having never commited to a girl before, finds her fascinating and pursues her; this series is the story of their relationship, and of what will eventually be Mei's slowly returning to a sociable life. I will admit straight out front that Say, "I Love You" has a plot that's fairly typical of its genre of shoujo romance. I will also say that a few early missteps aside, it shows that a little effort can go a long way in regards to making such a plot feel fresh again, which is ultimately exactly what Say, "I Love You" does. Although the show goes through a few cringe-inducing steps to bring its leads, Mei and Yamato, together, my opinion of the show began to improve as they grew closer, with a solid supporting cast and pleasant aesthetics making this into one of the better picks of the shoujo romance genre. Say, "I Love you" isn't spectacularly animated anywhere, aside from its unconventionally rotoscoped next-episode previews, but it looks and sounds pretty throughout. The backgrounds are detailed with the attention given to making this show's town feel like an actual city, and the character design is pleasant and polished, with the characters themselves being nicely animated and attired. An aspect about the show that I appreciated was its using blurry, nightmarish sequences drawn in an uncharacteristically hazy style to represent Mei's past bullying to the audience, and while this show isn't anywhere close to, say, Koe no Katachi in regards to realism on that front, the decision to do this, instead of loading the series with narration-heavy flashbacks, did wonders to my impression of the show. Some long, lonely vistas of Mei standing in front of beautifully drawn but forlorn-looking cumulus clouds made her isolation feel much more real, also. Aurally, Say, "I Love you" is also a pleasure, with an effective and subtle orchestral soundtrack filling out the background, and an absolutely gorgeous, peaceful, and melancholic song, a posthumous release of Ritsuko Okazaki, setting the mood perfectly at the beginning (the more upbeat ED doesn't compare, though it isn't bad). Now, I had some reasons to be skeptical of Say, "I Love you" at the start. The basic element of an unpopular or lonely female character being "saved" by the not-entirely-rational interest of a "prince" character," in this case the most popular boy in school, is highly overdone, and it isn't handled especially well in this case. Mei's attacking Yamato feels somewhat slapstick and thus out-of-place when compared to the rest of the show, and Yamato's becoming interested in Mei in the first place feels somewhat forced; while Mei is a character I like, what is it about her that actually draws him to her? The uncertainty in this presents the possibility that he is approaching her out of pity or as a savior figure, and the early episodes of the show simply don't do a great job of setting the stage to their relationship. To make matters worse, the show pulls a hare-brained plot device that has already managed to severely annoy me once before, in Magical Warfare: Mei, who is being stalked by a creepy customer of the bakery she works at, cannot reach her mom and calls the only other person she can think of, Yamato, instead of calling the police. His solution is to pretend to be her boyfriend and go as far to kiss her, which comes across as sneaky and callous, casting some doubt on his status as a "nice" character in addition to constituting a damned stupid plot device. It's a shame that the early episodes suffer from these problems, because Yamato is, in general, otherwise a pleasant character who doesn't show any sign of pitying Mei or seeing her as a plaything; she does, unsurprisingly, begin to fall in love with him, and yet what did surprise me is that they develop a genuinely comfortable rapport. While I thought of giving this show two stars during its early weak portions, at its best it was refreshing, for neither's personality is exaggerated needlessly for comic effect, and I often empathized with Mei during such moments as when she struggles to tell anybody she even has a boyfriend, something that felt close to home for me, as a once-very shy person. Some gimmicks aside, meanwhile, there were some portions of the show that struck me as far more honest than most material within romances. For example, when Yamato is talked into becoming a modeling partner for an attractive classmate, Megumi, Mei has a hard time explaining to herself why she feels unhappy with the situation, which turns to simmering fear once she realizes that Yamato, oblivious to Megumi's affections, has been going to her house for dinner almost ever night. I enjoyed this aspect because it makes sense that Mei would be hurt, especially since she takes a very long time to get over the (undeserved) sensation that she isn't good enough for Yamato, and it's satisfying when some of her other newfound friends realize this and convince Yamato that he's being insensitive. Now, the best course of action might have been if the show had found a way to reaffirm Mei's confidence without relying on her boyfriend, which is a frustrating trope of shoujo anime, but it was still a nice aspect. And I did generally like the supporting cast of the show and Mei's interactions with them. Mei, who when not being quiet might be best described as blunt, has several pivotal scenes in which the show establishes her as loyal, in spite of her outward hesitancy to make connections. She does not, for example, hesitate to snarkily call a pair of stuck-up girls "unoriginal" for making banal jabs about the breast size of Miki, another classmat who has been nice to Mei. In another scene, she proceeds to tear apart a male classmate as he starts to yell at a girl who is image-obsessed to the point of being anorexic, Anko, and deride her as weak; even though Anko had been rude and catty towards her, she has the sense to admit to Anko's internal strength in having endured an eating disorder, and the classmate's being pathetic in tearing her down for it. I won't say that these characters struck me over the head with their originality, but they did ultimately surprise me, just as Mei's bluntness makes her into a more active agent than she might have been. Though she's a minor character, I also ended up admiring Mei's mother, who clearly does the best she can while being strapped because of work, and who has a particularly nice bonding scene with her daughter later in the series when the latter tries on a yukata for the first time. The aforementioned Megumi has an interesting arc once her self-image problems become apparent, and another pleasant surprise was Yamato's younger sister Nagi, who initially comes across as yet another hotheaded little girl with a brother complex and jealousy of any girls who go near their precious onii-chan. Thankfully, this aspect was quickly downplayed, as she and Mei ended up bonding over Mei's admiring Nagi's cooking skills and the two's shared experiences with false friends, and she ended up being rather cute. Overall, I won't say that Say, "I Love You is overflowing with original thoughts, but it ends up being a nice show aside from its difficulties in setting itself up, as well as a final episode that, likely due to the manga being ongoing, feels tacked on. It's a solid choice if shoujo romance is your genre, and if not, it has enough nuance to overcome a fair number of the genre's pitfalls, even if it won't ultimately transcend it. Recommended Audience: There are some dark aspects to this show that would make it inappropriate for kids; it addresses bullying, stalking, and anorexia seriously (with slightly graphic images in the case of that last example), and it's heavily implied that a character is suicidal in one scene. The show also openly discusses several characters being promiscuous, though there's little in the way of fanservice. 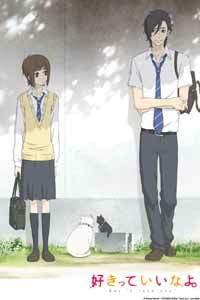 Say, "I Love You" © 2012 Kanae Hazuki, KODANSHA/Say, "I love you" Committee.